You still have some time to nominate names for Pluto features that NASA's New Horizons probe will discover during its epic flyby of the dwarf planet this summer. The deadline for the "Our Pluto" naming campaign — a collaboration involving NASA, the International Astronomical Union (IAU) and the SETI (Search for Extraterrestrial Intelligence) Institute in Mountain View, California — has been extended from Tuesday (April 7) to April 24. "Due to increasing interest and the number of submissions we’re getting, it was clear we needed to extend this public outreach activity," Jim Green, director of NASA’s Planetary Science Division, said in a statement. "This campaign not only reveals the public’s excitement about the mission, but helps the team, which will not have time to come up with names during the flyby, to have a ready-made library of names in advance to officially submit to the IAU." You can suggest and vote on names at http://ourpluto.seti.org. New Horizons team members will then go over the results and submit their recommendations to the IAU — which famously re-classified Pluto from "planet" to "dwarf planet" in 2006 — for official approval. "I'm impressed with the more than 40,000 thoughtful submissions," Mark Showalter, a New Horizons science team co-investigator at the SETI Institute, said in the same statement. "Every day brings new lessons in the world's history, literature and mythology. Participation has come from nearly every country on Earth, so this really is a worldwide campaign." 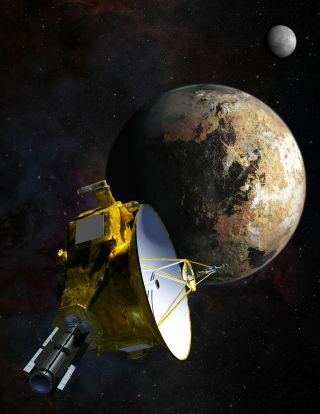 The $700 million New Horizons mission launched in January 2006 and is now on Pluto's doorstep, more than 3 billion miles (4.8 billion kilometers) from Earth. The spacecraft will zoom through the Pluto system on July 14, coming within just 8,500 miles (13,600 km) of the dwarf planet's surface. The historic flyby will give scientists their first-ever good looks at Pluto and its five known moons. Because it is relatively small and orbits so far from the sun, Pluto has remained largely mysterious since its 1930 discovery.